The Magnificat is one of the most frequently set texts in the history of music, alongside Mass. That is because it has become a part of Vespers, performed every day of the week. As it also found its entrance in the liturgy of the Lutheran and the Anglican churches, it was probably more frequently set and performed than the Marian antiphons. 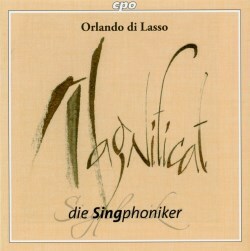 However, it seems unlikely that any composer has written more Magnificats than Orlandus Lassus. The number of settings attributed to him is 110; 101 of these are considered authentic. The most remarkable aspect of Lassus's output in this department is that forty of these settings are based on pre-existing material, either sacred (motets) or secular (madrigals, chansons). Here a procedure which was very widespread in Masses and is known as parody is applied to the Magnificat. The Magnificat was usually part of the alternatim practice. In Lassus's settings only the even verses are set polyphonically; the odd verses have to be performed in plainchant. In this recording the plainchant differs from one setting to the other; the sources of the plainchant are not given. This creates some variety in itself, but the main reason why these settings are so different is the variety between the pieces from which Lassus took melodic material. There is a strong contrast between Josquin's motet Praeter rerum seriem and, for instance, the chanson Il est jour by Claudin de Sermisy. This results in Magnificat settings which are very different in character and in length. One may wonder why Lassus used secular pieces as the foundation of so many Magnificat settings. In the liner notes we read: "The question becomes even more urgent when we bear in mind that the listeners surely would have recognized this or that source. As David Crook has demonstrated, the decisive motivation may be seen in the intention to elevate secular music of the highest quality to a higher level of content by reshaping it as liturgical music. On the musical side the new design of the preexistent material, often elaborated in the most sophisticated way, suits the new text." The modern listener should not expect to recognize the original melodies easily. The Magnificat which is based on Josquin's Praeter rerum seriem is one of Lassus's most famous pieces and the motet is also pretty well-known, unlike the madrigals and chansons. Moreover, Lassus treats the material very differently. He may quote the opening phrase— always most easily recognizable—but also often takes a phrase from elsewhere, sometimes from the upper voice but also from the inner parts or the lowest voice. The quotations are also embedded in the musical fabric, which makes them even less easily recognizable. Another interesting question is why Lassus composed so many settings of this text. David Crook, who was already mentioned in the quotation above, devoted a book to this part of Lassus's output. He states that the chronology of the Magnificat settings suggests that most of them were written after the Council of Trent which initiated the Counter-Reformation. Its reforms also affected the liturgy. The title of Crook's book says it all: Orlando di Lasso's Imitation Magnificats for Counter-Reformation Munich. The Counter Reformation went hand in hand with a growing veneration of Mary at the Munich court. The fact that very few of Lassus's Magnificat settings were published during his lifetime indicates that most of them were specifically intended for use at the Munich court. The Magnificat super Praeter rerum seriem is pretty much Lassus's only setting which is really well known and is regularly performed and recorded. It was, therefore, a splendid idea to bring together a number of settings of this kind. It is also nice that every Magnificat is preceded by the piece on which it is based. The Singphoniker have a relaxed way of singing, very pleasant to the ear without being superficial. They are well aware of the differences between the various pieces and especially between the sacred and the secular. The acoustic is rather intimate, which seems perfectly suited to this repertoire. Obviously the madrigals and chansons were intended for domestic performance, but the Magnificats were performed at the court in Munich, so this also suggests acoustics that is not too reverberant. This is the second Lassus disc by this ensemble. Mark Sealy welcomed the first disc - also with uncommon repertoire (review) - and this new release deserves an equally positive reception.